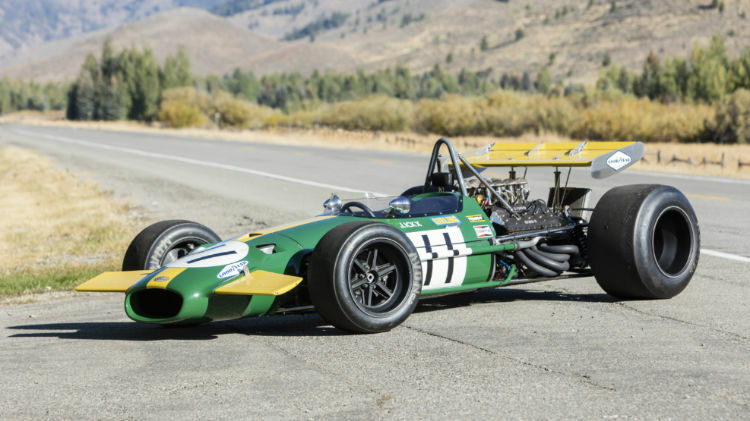 The 1969 Brabham-Cosworth BT26A that Jacky Ickx drove to victory at the Canadian Grand Prix is on offer at the Bonhams Amelia Island 2019 sale. 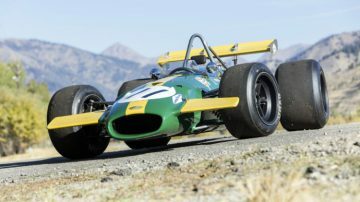 Bonhams announced the 1969 Canadian Grand Prix-winning Brabham-Cosworth BT26A – as driven to victory at Mosport Park by the Belgian legend Jacky Ickx – as a star car for the Amelia Island Auction 2019. The Brabham chassis debut in 1968 at the hand of Jochen Rindt but the unreliable Repco V8 engine led the car down. Rindt still managed to place the Brabham on pole at the 1968 Canadian GP. 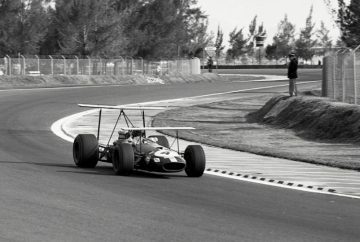 In 1969, the Brabham was powered by a more reliable Cosworth and driven by Jacky Ickx in 12 grand prix races to three podium finishes. It would later also race in the SCCA. Bonhams scheduled its fifth Amelia Island sale for March 7, 2019, at the Fernandina Beach Golf Club in Florida, USA. Bonhams is the smaller of the big three catalogue auction houses at Amelia Island and had mixed results in recent years. In 2019, Bonhams earned $16 million with a respectable sell-through rate of 84%. Highlights of this sale were two dozen American antique Brass Era cars from the Don Boulton Collection. In 2018, Bonhams earned $13.4 million and in 2017 the gains were around $10.2 million. Bonhams’ best Amelia Island auction was in 2016 when it earned $27.5 million in sale that included a $9,735,000 result for a 1937 Bugatti Type 57 SC Sports Tourer while a 1937 Mercedes Benz 540 K Cabriolet A sold for $2,970,000. 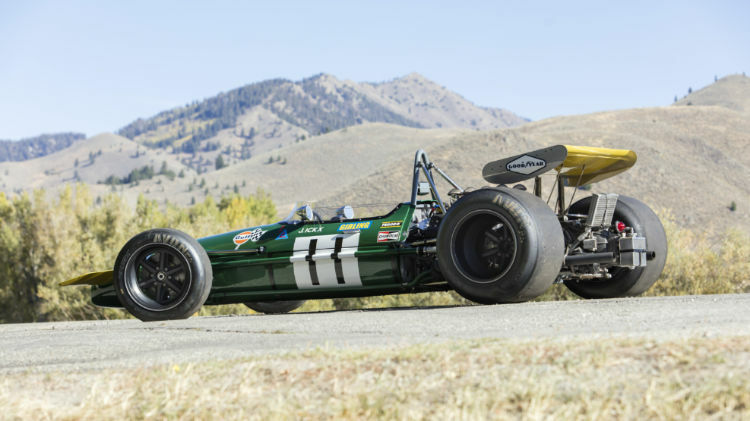 The 1969 Brabham-Cosworth BT26A chassis #3 is a remarkable Formula 1 racing car with an impressive pedigree. It was famously driven by Jacky Ickx in 12 Grand Prix races in 1969 including to victory in the Canadian Grand Prix and two further podium finishes. However, it started life in the previous season powered by a Repco V8-engined and driven by Jochen Rindt. 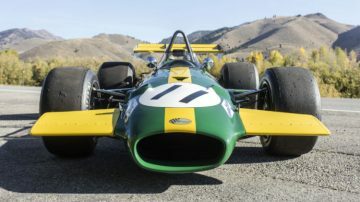 So Brabham-Cosworth BT26A chassis 3, as now to be offered by Bonhams, not only has an illustrious Grand Prix-winning history, it was also the Formula 1 car of choice for two of the most successful, charismatic and best-respected personalities from that classical closing era of the Swinging Sixties. This Brabham-Cosworth BT26A would prove to be the ultimate expression of multi-tubular welded spaceframe chassis technology within Formula 1, as all frontline F1 cars from 1970 onward used stressed-skin monocoque construction instead. The Brabham-Cosworth BT26A chassis #3 is the car in which Jacky Ickx contested no fewer than a dozen races during that 1969 season, nine of them fully-fledged frontline qualifying rounds of that year’s Formula 1 World Championship series. Of his nine topline races in chassis 3, the immensely capable young Belgian won the Canadian Grand Prix at Mosport Park, finished 2nd in that year’s Mexican GP at Mexico City, 3rd in the French GP, 5th in the Dutch GP and 6th in the Spanish GP. His three further non-Championship races in this wonderfully evocative F1 car also included victory in England’s Oulton Park Gold Cup race, and 4th place in the BRDC International Trophy at the world-famous Silverstone circuit. Jacky Ickx, meanwhile, completed that memorable 1969 season in 2nd place in the Drivers’ World Championship table, headed only by new title holder Jackie Stewart. His overall Formula 1 career would span 14 years and he would win eight Grand Prix races, appear 25 times on the top-three podium, and in 1970 he again finished 2nd in the Drivers’ Championship table. That year he was led only by the legendary Austrian star Jochen Rindt, who became, sadly, the sport’s only posthumous World Champion, having crashed fatally in his Lotus during qualifying for the Italian GP. Ickx went on to lead the Ferrari factory racing team from 1970-73, and would subsequently win the 24 Hours of Le Mans a then-record six times. He would also win the North American CanAm Championship in 1979, plus the prestigious Paris-Dakar Rally. 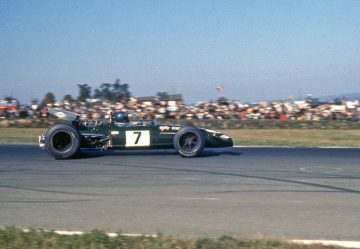 In fact, the 1969-specification Brabham-Cosworth BT26A chassis 3 had actually begun life in 1968 as the Repco V8-engined Brabham BT26 chassis 3, and Jochen Rindt had driven it four times. He had used this car upon its debut in the Oulton Park Gold Cup, followed by contesting the Canadian, United States and Mexican GPs. Although the Australian-made Repco V8 engine – which had powered the Brabham team to consecutive World Championship titles in both 1966 and 1967 – proved woefully unreliable in their 1968 campaign, Rindt still qualified chassis 3 on pole position for the Canadian GP, and ran 2nd there before retirement. Once the Repco V8 engine had been replaced in chassis 3 by one of the standard-setting Cosworth-Ford DFV V8s for 1969, the car was re-titled as a BT26A. In Mexico City, immediately after Ickx had finished 2nd, chassis 3 was sold to American entrant Doug Champlin for his driver Gus Hutchinson to campaign in the 1970 SCCA L&M Championship, against 5-liter Formula A/5000 competition. Hutchinson drove the car in six 1970 L&M rounds, winning two – at Sears Point and Dallas – while also placing 2nd at Sebring and 4th at Edmonton. He also drove it in the 1970 United States GP at Watkins Glen.